Never paying taxes on gains in a Roth IRA makes it a perfect place to capture big growth. Here's a stock that's ideal for your Roth that you've probably missed out on. The Roth IRA is an amazingly powerful way to save for retirement. You may not get the tax savings now that come along with contributions to a 401(k) or traditional IRA, but when you retire and start tapping it for income, every dime you take out is 100% tax free. That makes the Roth a great place for your best long-term investment ideas. And when it comes to capturing great long-term returns, Caretrust REIT Inc (NASDAQ:CTRE) is at the top of my list. And while it's one you may have never heard of, it's definitely the kind of company you'll want to know more about, because this upstart in the senior housing and healthcare real estate business is positioned for multiple decades of big growth. Keep reading to learn more about why it's a perfect long-term holding for your Roth IRA. Generally speaking, most REITs -- real estate investment trusts -- are viewed as income investments. That's because they are, essentially, publicly traded mechanisms that allow individual investors to invest in real estate. They get some special tax benefits by being structured as a REIT, but they're required to pay 90% of their income in dividends, and their assets must be at least 75% real estate or cash equivalent holdings. But in some special cases, a smaller REIT like Caretrust, which owns fewer than 200 properties and has a market capitalization of less than $1.5 billion, comes along and gives investors an opportunity for both dividends and capital appreciation. Since the beginning of 2015 shortly after going public, Caretrust has more than doubled its property count, tripled its market cap, and delivered 74% in total returns. But this is still the very beginning of its growth phase, as America's baby boomer generation continues to age. Between 2010 and 2029, the U.S. senior population will double to 80 million, with about half that population being 80 or older. This significant increase in the number of older Americans will require far more skilled nursing and senior housing than currently operates today. That's only part of the story. Today there is a small oversupply of properties in many areas, and the market is dominated by thousands of small operators. Caretrust's management has proved incredibly skilled at taking advantage of this situation, delivering big growth by acquiring and consolidating dozens of independent facilities under its umbrella, and then working with one of its large healthcare provider partners who run the facilities and care for the residents and patients, under long-term contracts. At recent prices, Caretrust shares pay a 4.5% yield. That's a sizable dividend that's more than double the average S&P 500 stock. But investors buying Caretrust shouldn't just be buying it for the yield. After all, there's even more to like. Caretrust has proved capable of solid dividend growth. 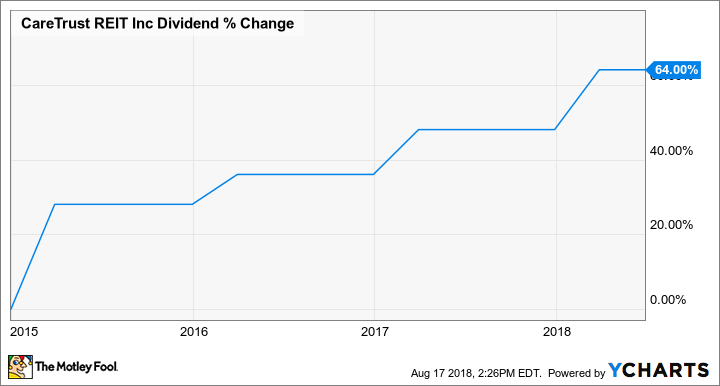 Since initiating a quarterly dividend in late 2014, it has increased the payout four times, and it's up a remarkable 64%. The company should be able to continue regular increases, and probably in the high-single digits to low-double digit range. That alone should significantly boost long-term returns, particularly if you reinvest the dividends into more Caretrust shares. 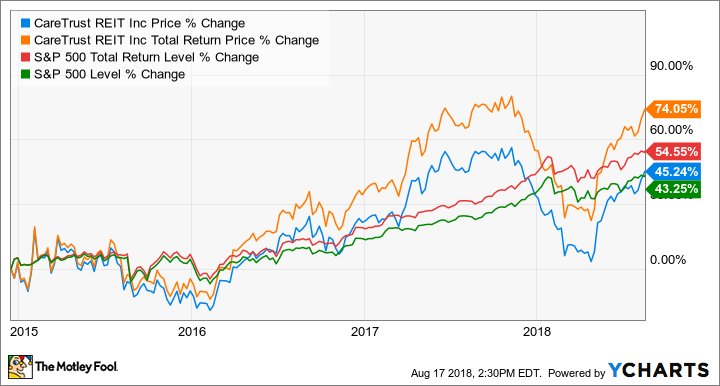 Caretrust's stock price has certainly had its ups and downs over the past year, as concerns over rising interest rates (REITs use a lot of debt to acquire property) and fears over cuts to government spending for senior care sent plenty of investors to the exits. But over the long term, I expect the sheer market opportunity to provide the much-needed facilities to support our growing senior population, and a growth strategy under an excellent management team to continue the long-term trend of market-beating results.